Belize ruins are easily reached; organize your own tour of ruins in Belize using this complete list of all Belize pyramids with locations, photos and descriptions. 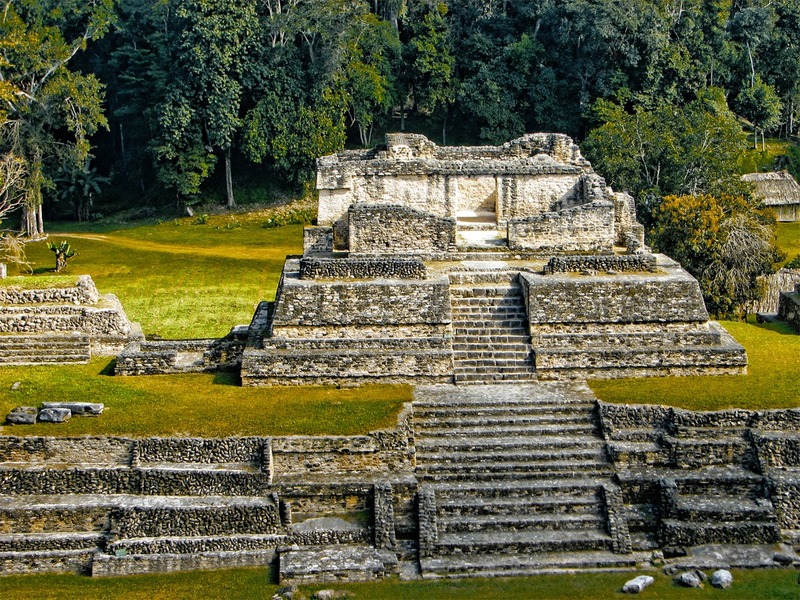 There are about 12 major Mayan ruins in Belize: Caracol, Xunantunich, Lamanai, Cahal Pech, Nim Li Punit, Altun Ha, and Tikal nearby in Guatemala plus others. 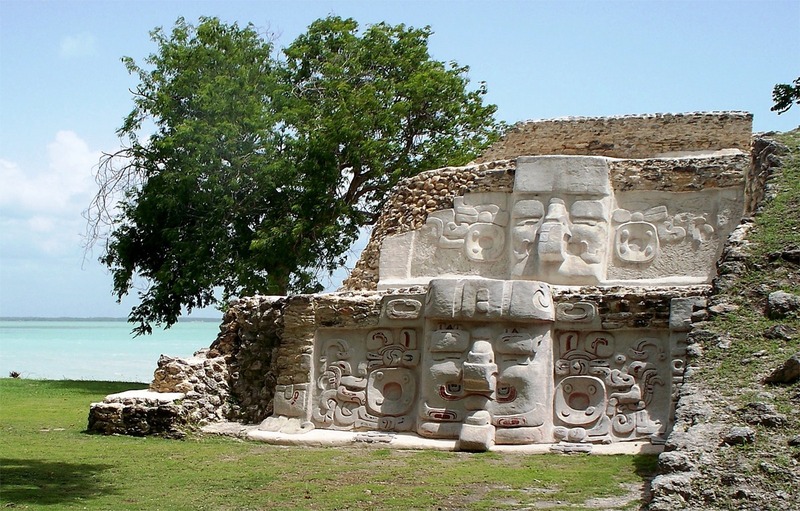 Belize plays an important role in the world of the ancient Mayan civilization. The Mayan nation was broken up into many kingdoms and principalities. There were bonds of a common language and religion, but theirs was not a unified kingdom. 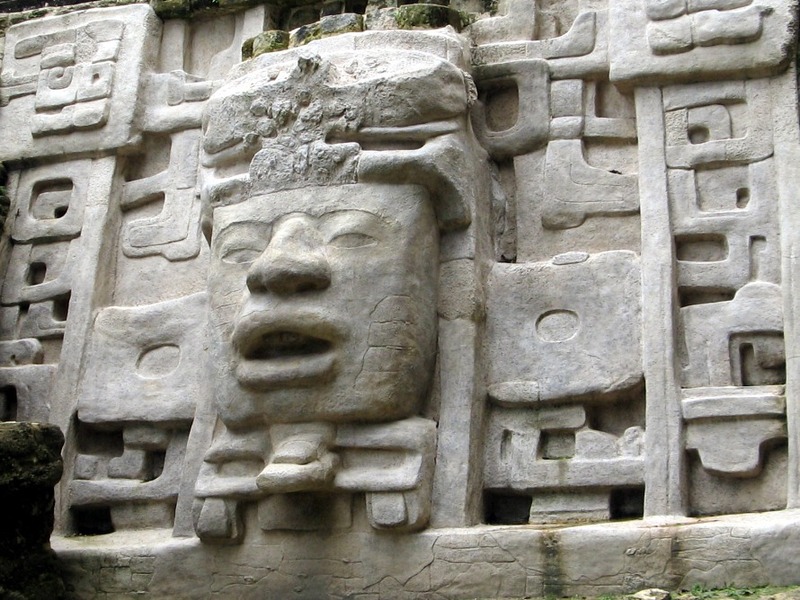 Inflation and recession, strife and peace, prosperity and starvation… all of these played a part in the Mayan world, which peaked between 600 – 900 AD. To learn all about Belize, visit this page on our site. Our tours of Belize visit Mayan ruins and caves. 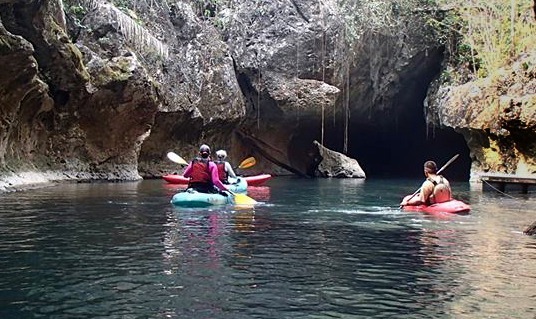 Belize Adventure Week visits Xunantunich and the Caves Branch River. Belize’s fertile ground, warm climate, and access to the rich marine life of the Belize Barrier Reef ecosystem led to a population explosion for the Mayans. 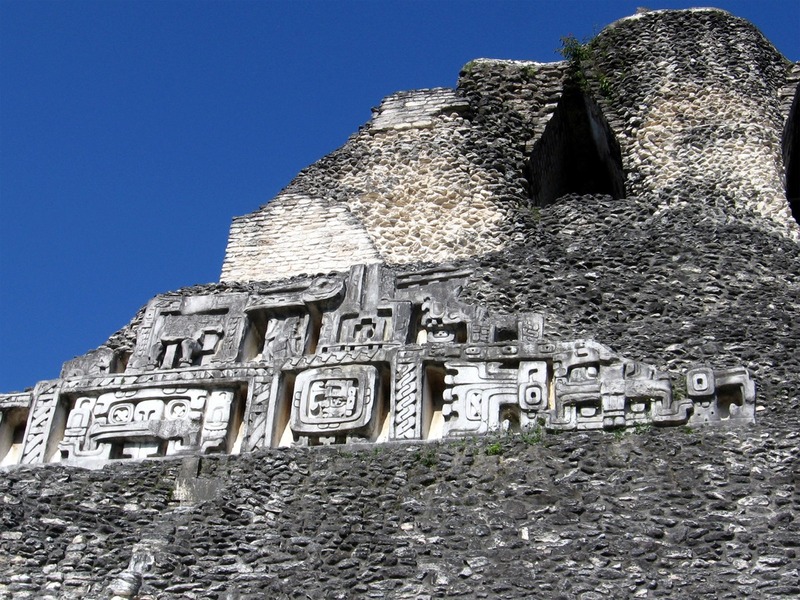 Large cities prospered, and today their ruins can be seen all over Belize. The Belize River was a primary trade route which connected the coast with other large Mayan kingdoms in Guatemala. Trade with Tikal and other huge Mayan communities dominated the commerce of the region. 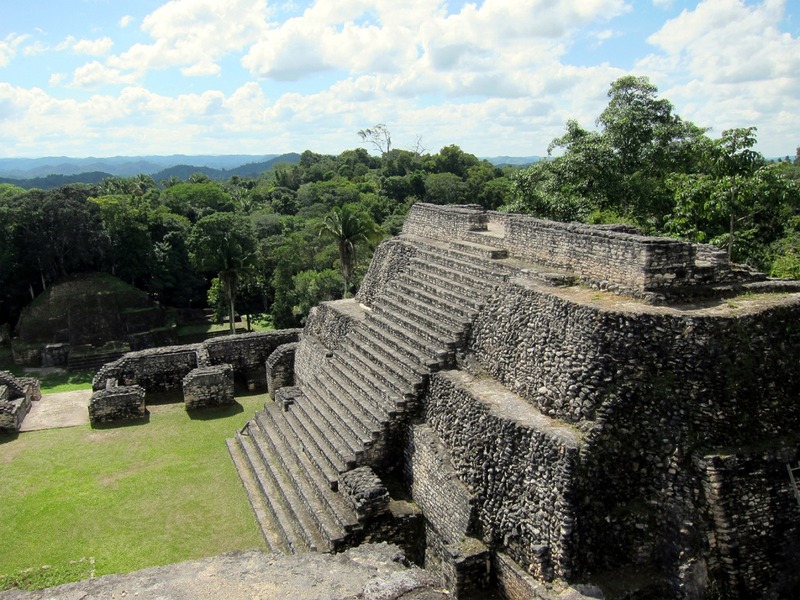 Caracol, the largest Mayan city in Belize, grew into a large, powerful Mayan city located in the Maya Mountains. The citizens of Caracol eventually conquered Tikal itself after one of the many wars between these two giant city-states. 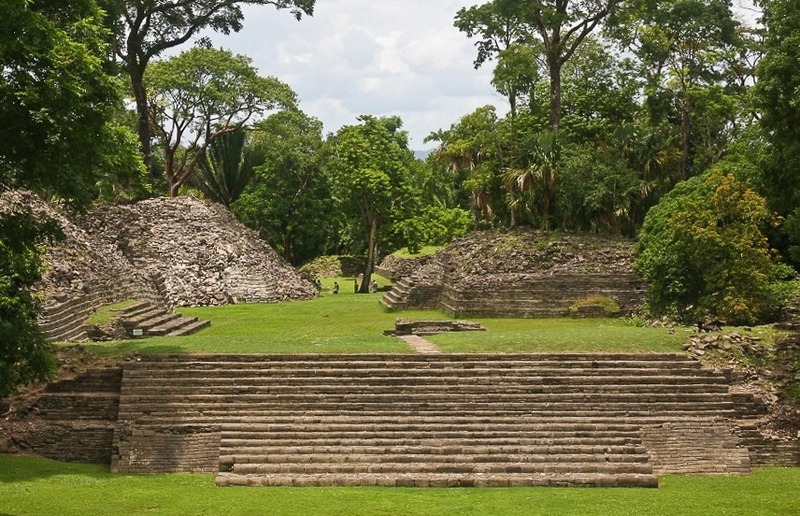 In addition to the restored ruins currently found in Belize such as Altun Ha, Caracol, Lamanai, Nim Li Punit, and Xunantunich, other large sites await exploration in the remote jungles throughout Belize. 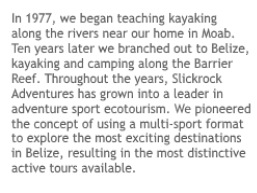 Many of these are known, but many remain undiscovered and expeditions continue each year. Belize caves are also known for the Mayan treasures that have been found deep within the earth. Caves were held sacred by the Mayans, and many contain ceremonial altars, religious carvings, and the remains of sacrificial victims. Large communities of ethnic Mayans are found in western and southern Belize to this day, where they have lived for 2000 years. First you will need a map of Belize that includes the major Mayan ruins in the country, you can order one from us (free). Then you need to decide which ruins you wish to visit. Finally, you locate these ruins on the map. Tours of ruins are arranged through lodges in the areas of the country from which they are accessed. Below is a table to the major Mayan ruins in the country, and where they would be accessed from. The shortest trip to Belize where you visit several Mayan ruins on your own would be four days. For a list of Belize airlines, visit our Flying to Belize page. You can also find an online Mayan ruins map elsewhere on our site. Located 34 miles north of Belize City and 10 miles from the Caribbean Sea, Altun Ha is the easist Mayan ruin to get to. Many day tours visit this site due to its proximity and easy access. Occupied for over 1200 years until the Classic Maya collapse around 900 AD, Altun Ha’s population peaked at about 10,000; about triple current populations within a 20 mile radius of the site today. Trade was likely an important aspect of the daily life here, as this site is one of the most accessible to the sea. This theory has been reinforced by the discovery of artifacts from as far away as Panama. 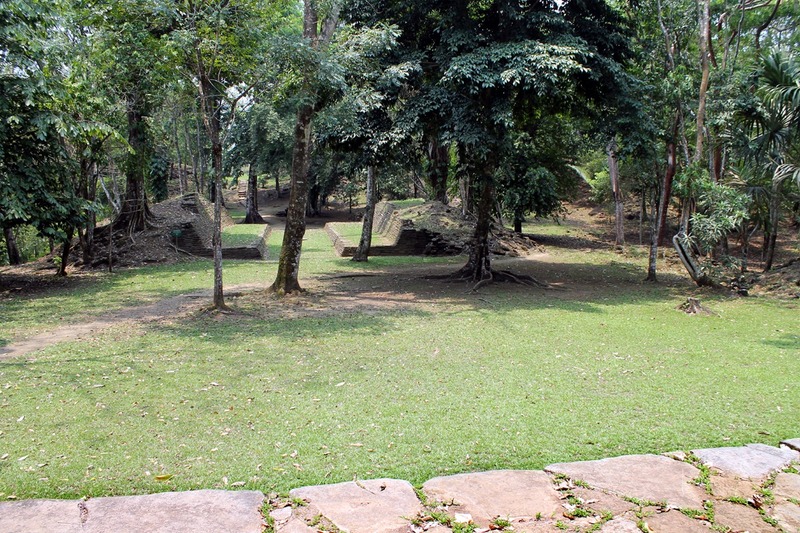 The core of the site consists of two plazas and 13 structures, although over 500 buildings have been found associated wtih Altun Ha. The core structures have been extensively restored, and a magnificent tomb was discovered beneath one of these structures. Dating from approximately 550 AD, the Temple of the Green Tomb is a burial chamber containing jade pendants, beads, and earrings, stingray spines, obsidian rings, and jaguar hides. The most exciting find so far has been the remains of a Mayan codex. The Temple of the Masonry Altars is the largest structure at Altun Ha . This temple is especially famous because it is featured on the Belikin Beer label (Belize’s own beer). This structure had been covered over with an even larger building, and expanded a least 8 times since it’s initial creation in 500 A.D. Seven layers were found, with the most impressive being the earliest tomb within the center of the ruin. Within the crypt a jade head which represents the Mayan sun god was found along with the remains of the body entombed there. This priceless jade object weighs about 10 pounds and is 6 inches in height. A replica can be seen in the Museum of Belize in Belize City. It is the largest jade object ever found in the Maya world. Visitors can easily walk along a short trail from the ruin south to Rockstone Pond, the village that gives the ruin it’s name. In Maya times the drainage was dammed to form a reservoir, and nearby stands the oldest structure at Altun Ha, a repository for a cache of antiquities imported from the city of Teotihuacan near Mexico City. These artifacts are evidence of the extremely early contact between the Belize Maya and Teotihuacan. Cahal Pech overlooks the town of San Ignacio in Western Belize. This interesting Mayan royal acropolis-palace has undergone extensive restoration. Cahal Pech means “place of ticks” in modern-day Maya, and refers to the fact that the surrounding area was once used as pasture land, although this was the dwelling of a great family. Cahal Pech was occupied around 1000 BC and abandoned 200 years later. The site consists of plazas, temples, ballcourts, residential houses, an altar, and a sweathouse, all situated in a very small area. A royal tomb was found in one of the structures. Inside the crypt a ruler had been laid to rest with the everything necessary for the afterlife: shell & bone ornaments, pottery vessels, obsidian blades, and jade artifacts, the most impressive being a jade & shell mosaic mask. The visitor center here has a display of a complete model of the site, along with murals showing Cahal Pech in its heyday, and an interpretive film. Caracol is located on the Vaca Plateau south of the village of San Ignacio. Caracol is the crown jewel of all Mayan ruins in the country, and in fact one of the largest in all of the Mayan world, which includes Mexico, Guatemala, and Honduras. Caracol was completely lost to rainforest cover for over 1000 years until its discovery in 1937, so it is still being restored. It is named “Snail” (“Caracol” in Spanish) because of the numerous snail shells found there, but the Mayans called it “Three Hill Water”, making this one of the few sites where the true name is known. The tallest structure in Belize – is Caracol’s “Sky Place” at a height of 137 feet. Over 100 tombs have been found at Caracol. 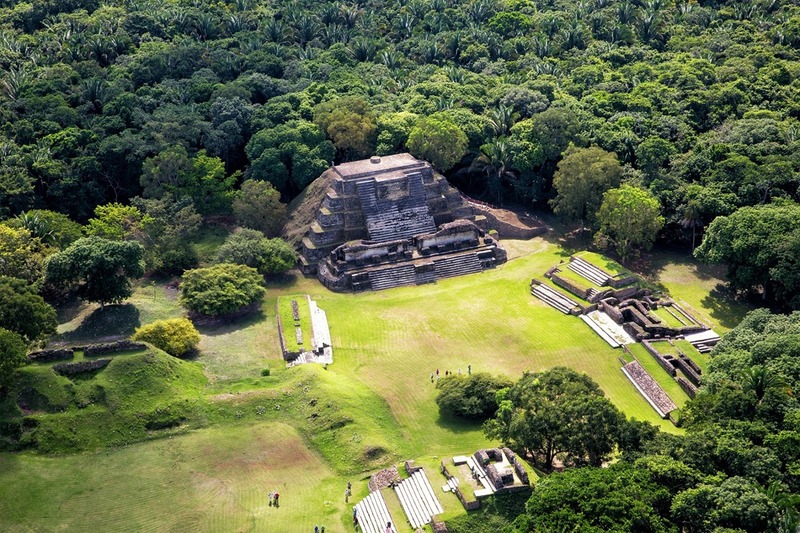 At its peak of occupancy, Caracol is thought to have been home to 150,000 people – a far greater density than at Tikal. Caracol was inhabited beween 600 BC and 900 AD, with some sources claiming it was inhabited until 1150 AD. The great Caracol city-state covered an area larger than modern day Belize City which has a population of about 80,000 at this writing. Culinary water was supplied by man-made reservoirs. One of these is used by archaeologists to this day. Explorers have discovered seven ancient roads leading to Caracol. Caracol’s ancient record provided many hieroglyphic inscriptions, enabling scholars to piece together an accurate record of Caracol’s rulers from 600 AD to 860 AD. Especially significant are descriptions of the conflicts with Tikal, located in nearby Guatemala. What puzzles archeologists is why such a large city was built in a location with no permanent water source. For more information Caracol, visit: www.caracol.org. Cerros is a small site located right on the Belize coast. Beginning as a small village in about 300 BC, development followed and 250 years later it grew quickly into a major city. Perched on a small delta in Northern Belize, Cerros was abandoned early and never re-occupied. There are only two Pre-Classic sites with no later additions, which makes it an important addition to the Maya record. Cerros contains five temples, several plazas, ball courts and a system of water-ways. Due to its location at the mouth of the New River, Cerros was a regional center of active trade. It is postulated that trade routes shifted inland, and the site declined. Eventually the temples were abandoned and Cerros returned to a simple farming community before being deserted altogether. the archaeological record tells this story. Arguably the favorite ruin in Belize (because of the wonderful river trip you take to get there, spotting exotic birds all along the way) Lamanai is the country’s longest continuously inhabited site. Research places the first dwellings at around 1500 BC. Lamanai is about 40 miles upstream from Cerros on the New River lagoon; the two cities traded extensively. Recorded by Spanish explorers, Submerged Crocodile is the verified official Mayan name of the city. The site occupies almost 1000 acres and 70 structures have been excavated, but 10 times that number have been mapped. One of the most spectacular features at Lamanai is the pair of jaguar masks flanking the stairway at the “Temple of the Jaguar”. All stelae at the site are in excellent condition. 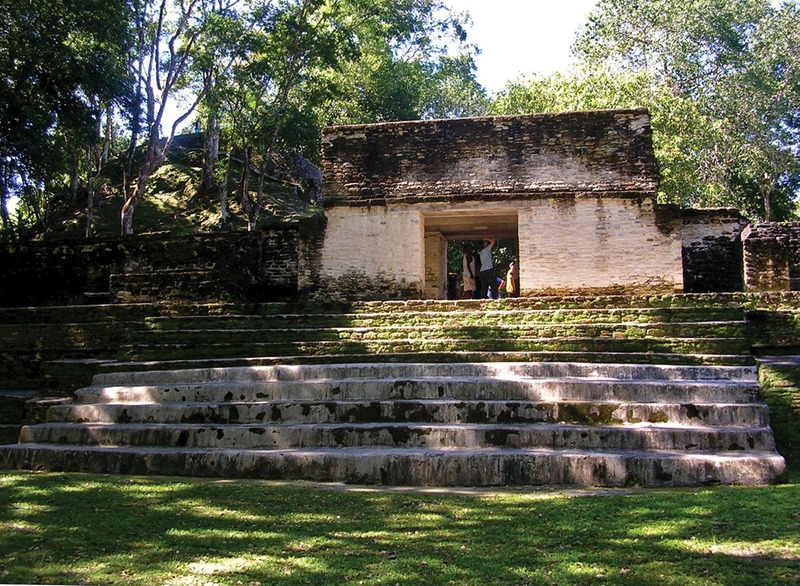 To read more about day trips to Lamanai out of Belize City, visit our Things to Do in Belize page. Located in southern Belize, Lubaantun can be visited if you are staying at Placencia or Punta Gorda, Belize. Sitting on a high ridge, the ruin actually affords a view of the Caribbean Sea over 18 miles away. The habitation period was brief, only 160 years from 730 to 890 AD. Jade and obsidian from Guatemala have been discovered here along with the bones of deep water marine animals, signifying and active trading region. Carved whistles and other musical instruments were also unearthed during excavation. Lubaantun is famous because the renowned Crystal Skull was discovered here. The Crystal Skull is carved from a single crystal of quartz. It is considered one of the greatest Mayan treasures ever uncovered, although there is great controversy surrounding the truth of the discovery. There is very little structural ornamentation at Lubaantun and there are no carved stelae either, leading to the notion that this was an administrative rather than a ceremonial center. Its rounded corners and simple shapes are like no other Maya site. The blocks use no mortar but are carved with particular precision so that the stones stay together easily. Although located far from most tourism destinations, Nim Li Punit is a wonderful site with much to offer the visitor. To get there you drive past the turn-off to Placencia on the Southern Highway, and go almost to Punta Gorda. Nim Li Punit is mostly known for the many spectacular stelae discovered there. The onsite museum displays many of the stellae, and the others are in place at the ruin. The most impressive stelae depicts a ruler wearing a diadem or “big hat,” after which the site is named. There is a nicely preserved ballcourt, and another plaza that was most likely an astronomical observatory. Major settlement was between 400 and 800 or 1000 AD. One of the more interesting structures is the Plaza of the Royal Tombs which was most likely a residence for the royal family, containing three tombs. One contains at least five people buried at different times. They were buried along with their treasures of pottery, stingray spines, and carved jade figures. Another tomb contained the remains of at least 6 people. Located in Guatemala, it is actually easiest to get there starting in Belize. Tikal is truly the supreme Mayan city. Tikal was originally a village, dated to 900 BC, making this among the oldest of Maya sites. The sheer scale of Tikal is overwhelming, and it is best to plan a trip with multiple days to explore. 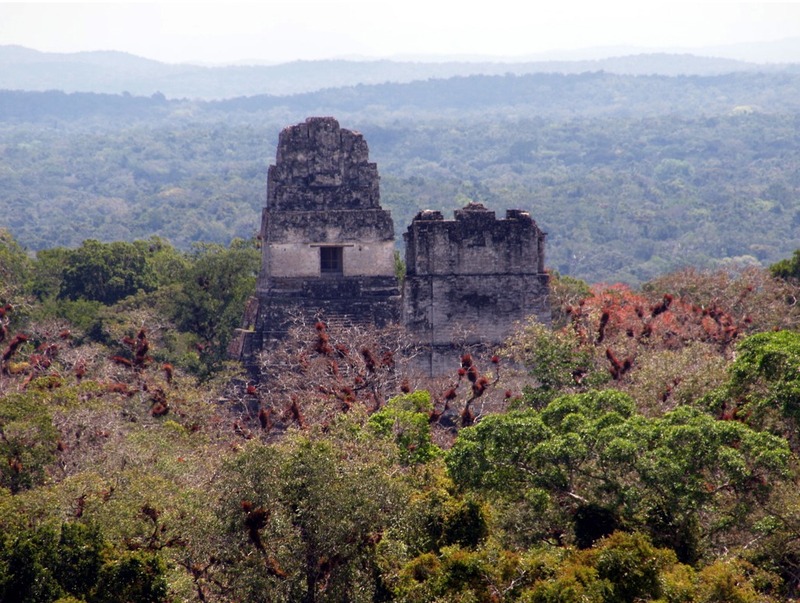 Some 10 square miles of central Tikal have been mapped by archaeologists. Huge stones brought down by river served as the building blocks and raw materials for gigantic sculptures that have been found nearby. Tikal has five enormous temples. These are steep-sided pyramids that rise up to tower above the jungle canopy. The Great Plaza is surrounded by stelae and altars, ceremonial buildings, residential and administrative palaces, and a ball court. At both ends of the plaza a gigantic temple faces the interior of the plaza. The Temple of the Giant Jaguar is the most famous of all of Tikal’s structures and measures more than 150 feet in height. No one knows what brought about Tikal’s final downfall, but by 900 AD almost the entire Mayan civilization had collapsed, and Tikal was abandoned. Related Blog Post: How do I get to Tikal from Belize? Xunantunich (pronounced “CHEW-nahn-too-neech”) is located only ten miles from the Guatemalan border. This major ceremonial center peaked during the Classic period of the Maya and is home to 25 temples and palaces including the second tallest Mayan structure in Belize. The restored areas of this huge city-state contain a ceremonial center, residences for the rulers of this civilization, a middle-class residential area, and the ubiquitous ballcourt complex. From the top of this pyramid “El Castillo”, one is rewarded with a breathtaking view of three river valleys. From its perch explorers can also see all the way to Guatemala. The construction is typical Maya; a low terrace was designed to hold additional stone buildings, and on this level a temple was built. Later the entire temple was filled in and another was built on top of it. Thanks to excellent archaeological work, we get to see the various periods of construction. From research we know that Xunantunich was in power for only a few hundred years and abandoned after an earthquake. We visit this ruin on our Belize Adventure Week package. We also offer it as a one-day tour out of Belize City for groups of eight or more. If you have a group of four and a full day, it is affordable to get a vehicle from a Belize City car rental and drive to Xunantunich yourself.